Good morning Dear Hearts! My computer has been down and I thought I had lost it for good but miraculously and with a good neighbor's help, it is revived!! 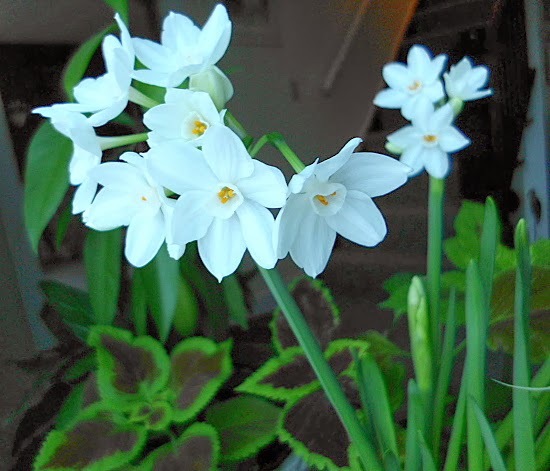 The photo of the Paperwhites I have grown from bulbs. This is the first time I have raised any flower from a bulb inside the house! They are fascinating, growing so rapidly and bringing joy to my winter rooms! 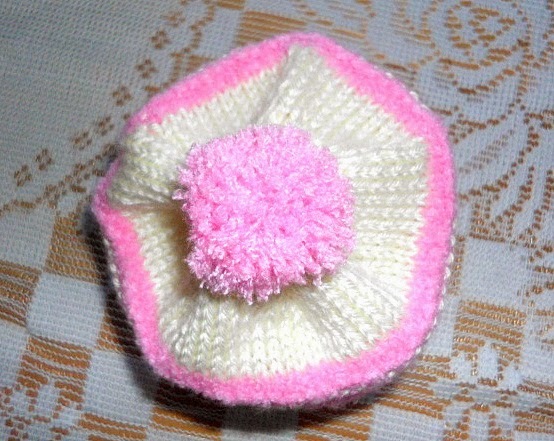 I just finished a new-born cupcake hat in knit, just love it! 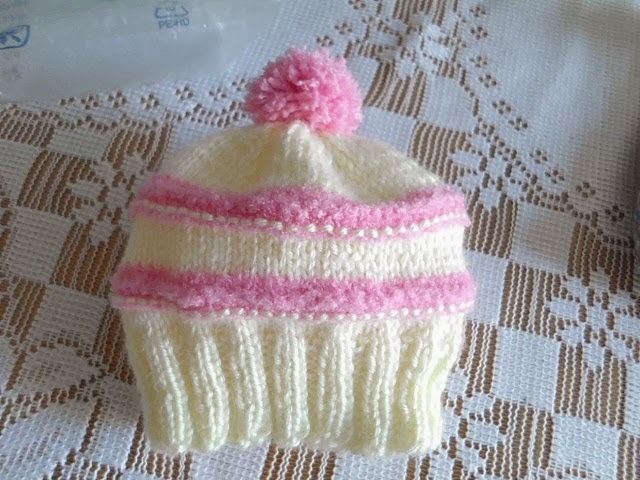 (you may purchase my homemade things on my Kerrie's Krafts 3 blog :) Also, a Hood bonnet is featured there. I am enjoying the front yard birds that come to my feeder. I placed it in front of the dining room window where my computer is near so I can watch all the goings on with Cardinals, Blue jays, and House Wrens visiting. 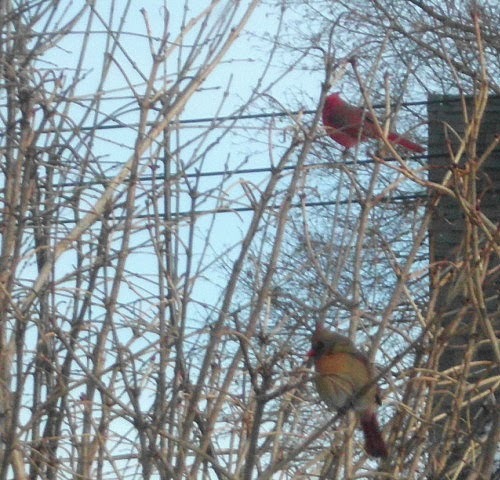 The Cardinals are always the most skiddish and I am constantly trying to get a good shot before they dash away-ha! They dash away to the branches of the Rose of Sharon bush. I never thought about electrical wires being in the photos now as in SC, everything is run underground. Not much has changed in my hometown-ha! 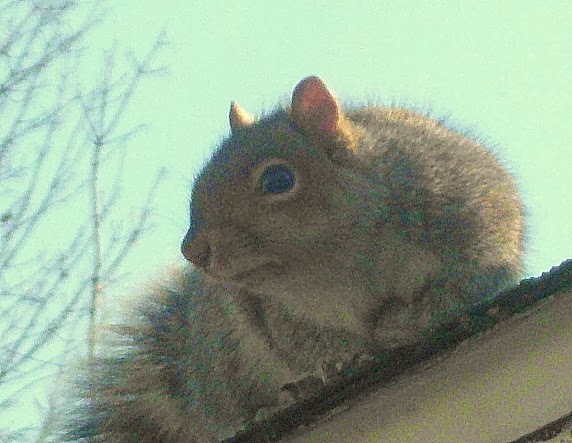 And of course I have a squirrel buddy here trying to figure out the best course of action to pounce on the feeder below. So far, he has not found a way and merely watches me as I take his picture-ha! Thank you so much for visiting me today and come back soon! If you have time, please visit my other blogs listed in the sidebar. And leave a comment, it is very easy to do and I treasure them! :) Have a most wonderful day!